Very pleased with my order placed with Custom Earth Promos. This is precisely what my company was looking for. CEP insulted coolers are super durable. We gave away these insulated cooler bags at our most recent workshop. Everyone loved them. Thanks for the business. Love this product. Extremely high quality bags. Can't wait until I place my next order for my upcoming convention. My colleagues and I would like to thank CEP for the unique durable eco-friendly bags. Easy to maneuver through your website and very friendly customer service. We handed these out at our trade show with every new membership to our club. Side pockets are convenient I place snacks in them that I do not want to get cold. Our bags came out amazing! Thanks CEP! Such a high quality product! Our logo looks amazing on these bags as well. Thank you! Extremely high quality. Couldn't be happier! Really impressed with these bags. The insulation works great. The reusable ice packs are great they last a long time in the bag, this is a tribute to the good insulation the bag has. I use this bag to carry meat and drinks in and they always stay cold. Well made, great insulation my drinks stay cool for hours, I recommend the CR5 bag. All of our students received this bag at the beginning of the new school year. Nearly all of them use it for lunch and there sports teams. It brings a great value to our students and gets them in the practice of reusing bags for lunch and not using the wasteful plastic bags that just harm the environment. We sell this cooler lunch bag at my grocery store, we now have a section where we sell a bunch of reusable bags from custom earth promos. 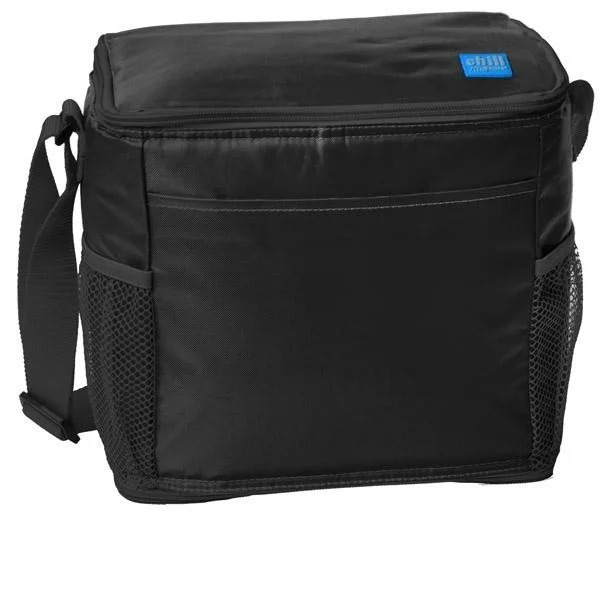 This cooler bag is one of the most popular sellers, it is very durable and a lot of mothers I see buying it to use for there sons and daughters for school lunch. Our imprint came out great. There were a bunch of different options to choose from. These bags are great! They are easy to carry around all day and easy to clean! Great bags! Plenty of space for bigger items and easy to transport! The insulation works well for this bag. I recommend this bag and custom earth promos. The handle adjusts which is nice, all of our clients are different sizes and use it for a variety of uses. We received great customer service from custom earth I will be using them again because it was easy to work with them. I own a construction company and noticed all of our workers using different coolers for lunch. I had the idea to make them use a standard cooler bag with our company brand logo on it and use this to our advertising advantage. They already all where uniform shirts and hard hats with our brand logo, why not lunch bags. This has worked out great and all the workers love the bag. This is now part of our uniform that we hand out to each new employee, a t-shirt, hard hat and a lunch bag. The red bag looks good, we ordered a mass quantity and recieved a great price. This bag was given to all patrons who sat in the 1st tier of the stadium as a promotion. I have seen several fans come back using the bag for tail gating. It was a good way to get our venue's name out there. This is our best selling cooler bag, we have created 3 different designs of it in 3 different colors, all look great and customers buy them up. California banned the use of plastic shopping bags, as a butcher that is what I used to package our food. Now we charge our customers a small amount for this bag and they come in the store with them now and just reuse them. It is a much better system. Its better for us and the customers. I have only had good experiences with custom earth promos, so I and my team decided to keep the business relationship going and use them for cooler bags. Just like the previous recycled reusable bag orders, the cooler bags came out great as well. We are looking forward to the next order!! Thanks CEP!! Simply amazing! This bag comes with all the bells and whistles. Our clients love them! Good bag, the side mesh pockets add a cool design. Perfect for any outdoor festival, bbq, outing. We handed them out at a car show to promote our brand. My team and I decided to go with this model cooler bag as our gift bag for our clients this year. Our logo came out great and the standard colors went well with our logo and what we do. These bags are made from a durable 420D polyester material that is suitable for supporting heavy items. Due to the strength of this material, your customers can use these bags for years to come! 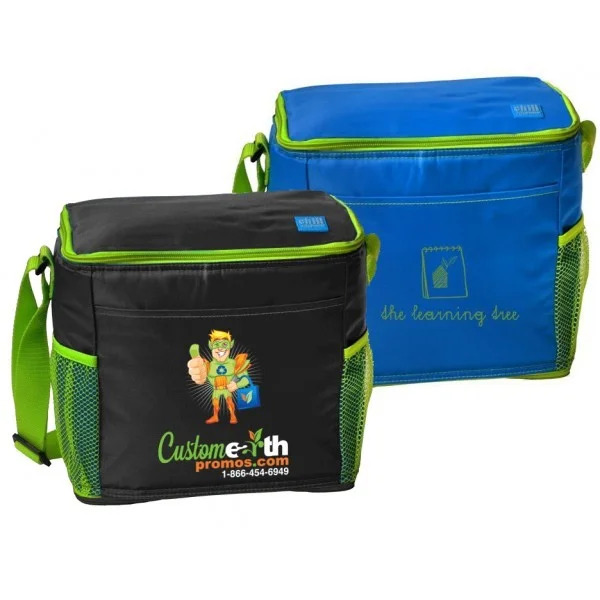 Custom Earth Promos has an all-new range of reliable and practical insulated cooler bags! Our drink cooler bags are the perfect alternative to plastic bags for your customers.Our Insulated Drink Cooler Bags can be customized to suit the advertising needs for any type of industry. They work especially well for businesses in retail, hospitality, and healthcare. 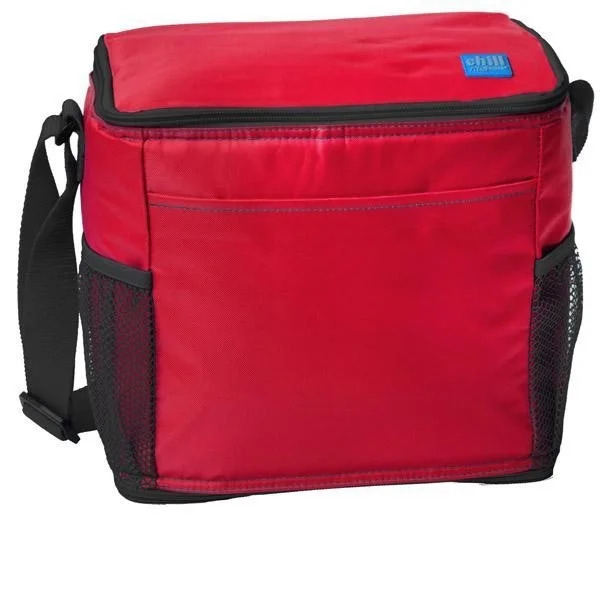 Our Insulated Drink Cooler Bags are available in three vibrant stock colors: Black, Red, and Royal Blue/Lime Green. You can even get them made according to the exact PMS color you require when ordering using our custom production factory. These eye-catching colors will make the perfect background for your design imprints and custom messages. The insulated material ensures that food and beverage contents are kept at the right temperature for long periods of time. At a convenient size of 9.5" W x 9.75" H, these bags are great for carrying beverages and food items for lunch, outings, picnics, or game nights. Each bag comes with a gusset of 5.5" D that provides additional space for carrying bulky items without damaging them. To make sure that valuable contents do not fall out from these bags, we have added a zippered closure to each bag. On top of all this, the bags are lined with re-freezable cubes of pure USA water. There is an option to get your designs imprinted on the top of the bag, as well as the front pocket. You can choose from an extensive range of stock graphics and stylish fonts for your custom imprint. All our products are tested according to the California Proposition 65 guidelines to make sure they don't contain harmful additives. Our custom production factory helps complete your wholesale order of Insulated Drink Cooler Bags according to your specific requirements. There are multiple decorating options to customize your order: multicolor spot color printing, full-color printing, embroidery, rhinestones, and even glitter with rhinestones! Since we supply directly from our factory, our prices are highly competitive and affordable, and our skilled designers ensure that your order is delivered to you within the requested time-frame.